I first came across these bunch of dayglo punks through Anoraks guitarist Gary Minall and promptly got their " Punk For Life" cdep off them. Suitably impressed, and realising there was a full album to follow, I quickly got in touch with Al the drummer to send me a copy. 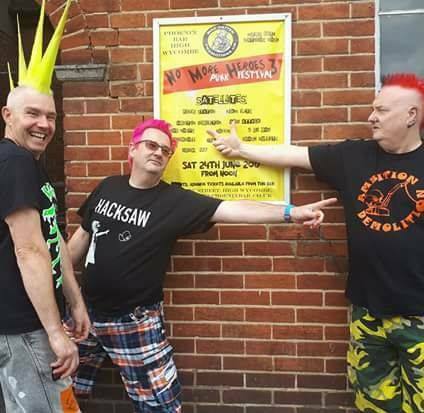 Albeit, a 3 piece punk outfit hailing from Gloucestshire/ Worcester, they have gigged consistently since their formation in 2016, Al's rantings on Facebook always amuse me, however there lies a passionate and intelligent critique of most things Monarchy, Tories, Religion etc, which obviously manifests itself into the music. Moreover, onto the album, 13 tracks in total, which to these cloth ears remind me of the Lurkers especially in the vocal department, Uk Subs and for some reason the Enemy ( the Punk band)? Which means great tuneful punk, with plenty of variety along the way. Standout tracks for me include I Don't Know, Good Insomnia, and the rather wonderful Us Against The World, which I'm sure goes down a treat in a sweaty shithole with plenty of real ale, while the whole place is singing along, however there isn't a duff track amongst them, and this is on constant rotation at the moment. Therefore, get in touch with Al Stone for a copy, and support a true diy punk band , absolutely punk for life!!!!! A great punk band with that seventies feel about them, nice review Ash.